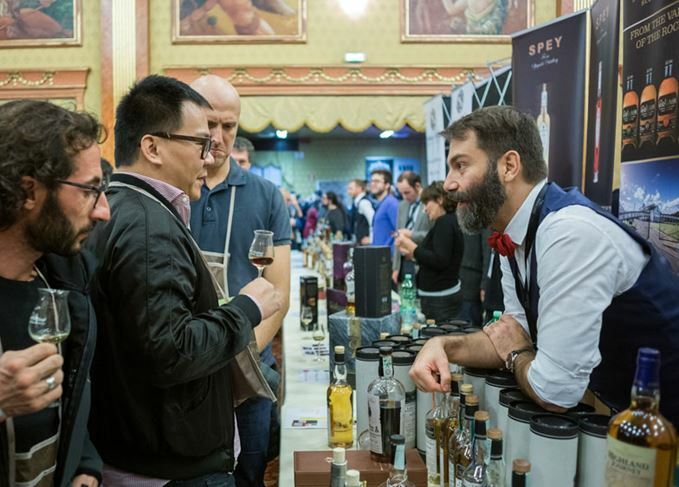 The largest whisky festival in Southern Europe is shedding its reputation as an exclusive ‘culture club’ and attracting a more diverse, global audience with its vast whisky selection and welcoming attitude, writes Marco Zucchetti. The epiphany came on Sunday afternoon, while asking Diageo's brand ambassador Franco Gasparri how the 13th edition of the Milan Whisky Festival (MWF) is going. As he was explaining that the new Talisker 8 Year Old has been ‘blown away’ and Bulleit cocktails are in such high demand, I realised that attending the festival are dozens of visitors from Asia, more than has been seen here over the past few years. The atmosphere is now becoming more international, and Milan is starting to transcend the borders of the Italian whisky scene. The Festival (10-11 November 2018) started on Saturday in a comfortable familiar style: Scottish weather outside, Milan looking like Glasgow. Getting to the Marriott Hotel one could meet small groups of guys running out the underground station, talking about the day’s schedule like football fans entering a stadium for a match. The festival looked crowded right from the very beginning at 2pm, and you could feel a particular enthusiasm, like being on a school trip. Giuseppe Gervasio Dolci and Andrea Giannone, MWF’s organisers, expected a good turnout – 10 of 16 masterclasses (more than ever) were sold out before the opening – although selling almost 700 tickets in advance was not a foregone conclusion. Especially this year, with several other whisky events held in the last two months: the first edition of Whisky Revolution Festival in Castelfranco, Veneto, the Whisky & Rum Day right in Milan at the end of October, and the concomitant Merano Wine Festival, that started on the very same day as MWF and for the first time hosted a seminar on spirits organised by the Rome Whisky Festival guys. Competition is getting tougher. ‘Maybe too much for a still unconsolidated market,’ one visitor mused, but companies’ and visitors’ budgets are indeed limited. All things considered, the goal of MWF18 was to demonstrate that the oldest and biggest whisky event in Italy is still the most popular and beloved. It’s true, particularly here where people have a sixth sense for the oldest malts. That explains why – according to visitors – the most appreciated masterclasses were the ones with aged drams, such as Max Righi’s of Whisky Antique, which featured a glorious 44-year-old Speyside and a 1997 Clynelish that bewitched a lot of hearts and palates. Also The Kinship tasting on Saturday night, with the extremely well rated Bunnahabhain 30-year-old; the Diageo Special Releases preview with Inchgower 27 and Oban 21; and a Macallan tasting held by European brand ambassador Nicola Riske with a 25-year-old edition. Impressive products were being shown by both distillers and independent bottlers, and this is another clear trend. Independent bottlings are simply idolised by Italian whisky connoisseurs. They remember the ones by Samaroli, D’Ambrosio, Rinaldi, Giovinetti, and therefore know that independent bottlings often happen to turn out as liquid jewels. While beginners are less aware, their attitudes are changing and even amateurs are more and more willing to try them, including lesser known Italian bottlers. Back to the previously mentioned biggest surprise of this edition, the large number of visitors from Asia (China, Taiwan, Japan, Singapore, South Korea, Vietnam) and Eastern Europe, albeit the latter on a smaller scale. Why did they choose Milan? First of all, Milan is experiencing a tourist boom. The Wall Street Journal recently described it as ‘the hottest new destination’ and the New York Times put ‘Italy’s fashion, business and affordable luxury capital’ on the front page of its Travel section. Secondly, there’s no other event in Southern Europe that displays a selection of 2,000 whiskies. It goes without saying that everyone has their own reason to come to MWF. Tan Soo San and his wife Sherin are from Singapore, where they run a ‘whisky library’ called The Writing Club. They usually visit Scotland, Japan and Taiwan looking for new drams to taste, but this year decided to fly to Italy precisely for MWF, and to attend Valinch & Mallet’s masterclass. It’s this increase in overseas visitors, coupled with more distillers coming here to present their products, that is giving MWF a more international attitude. In addition, there were other trends occurring at MWF that demonstrate where the Italian whisky scene is going. Firstly, peat is still ‘the’ single malt taste in Italy. By Saturday evening the Talisker 8 Year Old limited release and Loch Lomond’s Haddock whiskies had sold out, while Kilchoman’s stand was ‘stormed’. The festival’s Best Whisky awards revealed the same trend: among the top 12 whiskies voted by a jury, only one was unpeated. The show is becoming more accessible to all kinds of whisky lover. For the first time, seminars dedicated to absolute beginners took place, just to introduce amateurs to Scotch, Irish and Japanese whisky. As the curtain falls and this successful edition ends, MWF is seeing a new challenge on the horizon. How will it ride the international wave, to consolidate the event among foreign connoisseurs? Maybe a different location, less ‘Italian style’ and more ‘Expo style’? Or maybe something even bigger, with more wide-ranging media communication? But that’s the next match. Now the stadium is empty and everyone is satisfied, even if there is only one real winner: whisky, of course.